This early Edwardian view of Dale Road is still easily recognisable today, with the turrets of the Olde Englishe and what was Hunter's shop in the distance in the centre of the picture. The female in the green skirt and white blouse on the right is crossing the road outside what was the Queen's Head. The building next but one to the hotel, though not quite the same as today, is the old Market Hall (see link on the right). The first shop on the left, on the corner opposite what was then the entrance to the station, was a watchmakers. Henry Barnwell, whose name is painted above his shop doorway, had moved to Matlock from Warwickshire and founded the family business in Matlock Bridge 1876. The shop named after him was still advertising in the trades directories as selling jewellery, watches and china in 1916, though the premises became a bank shortly afterwards (see below). It is difficult to tell what Barnwells was selling in the left hand shop window; the items could be china ornaments and figurines. Down the right hand side of the doorway is a display of postcards of local views. After Henry's sudden death on 16 April 1887 at the age of 48 his widow, Hannah (nee Ludlam), who was his second wife, took over the watchmakers business but she did not survive her husband for long and died on 7 November 1889. Henry's son, Harry William Barnwell (1 Jan 1886-1949), then ran the business. The Barnwells were members of the Matlock United Reformed Church. Harry William also married twice; his first marriage was in 1890 to Ann Ludlam and, following her death in 1906, he went on to marry Eliza Ludlam in 1907. Both marriages took place at Matlock Bank's Congregational Chapel. In late 1913 the London City and Midland Bank announced that they were to open branch at Matlock.They had purchased Barnwell's shop and it was planned that the premises would be pulled down and entirely rebuilt. Mr. Barnwell was understood to be planning to give up possession the following summer and in the interim the Bank leased the old Post Office building on Snitterton Road/Holt Lane for two years, until their new premises were completed. At Christmas in 1913 the Bank announced that their Matlock branch had opened in its temporary accommodation pending the completion of the permanent office at Dale Road. Both Mr. Barnwell and the Bank were trading on Dale Road in 1916. The bank's first manager, appointed at the end of 1913, was Mr. William Henry Worthington but by 1928 Albert Edward Needham, who lived on Imperial Road, was the manager of the Midland Bank. This is the HSBC today. Harry Barnwell moved away; he was still repairing clocks part time in 1939. 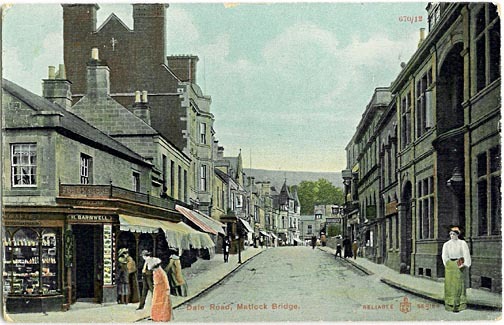 "Dale Road, Matlock Bridge", from the W R & S Reliable Series. Unposted. Mr. Barnwell placed an advertisement in "The AutoChrome Album of Matlock & District". View the images inside the front cover. The Barnwell's also advertised their shop at Matlock Bridge in various trades directories over the years including Kelly's Directory of Derbyshire for 1887 (Mrs. Henry), 1891, 1895, 1899, 1908, 1912 and 1916. "Derby Daily Telegraph", 19 April 1887. See the 1881 census entry for father and son. Also view the onsite transcript of the 1901 census for Harry W Barnwell and his family. None of the Barnwells were in Matlock in 1891. Records of their deaths in the Deaths Register 1881-1926 are on this website. Family burials were at St. Giles. They are listed in on-site indexes (Surnames B) although no MI is available on the site. "Belper News", 26 December 1913. Bank for Matlock. "Derbyshire Advertiser and Journal", 26 December 1913. The 1939 register, available on FindMyPast, shows him as living in Bedford.